20th Century Women sees the return of Beginners (2010) director Mike Mills in one of the most ambitiously stylish and quirky pieces of filmmaking of recent years. Being no stranger to technical wizardry from his years in the music video industry, Mills offers his audience an exhilarating mishmash of authentic 1970s nostalgia mixed with dream-like sequences and real-life footage, with a killer soundtrack to boot. Set in California during the summer of 1979, 20th Century Women charters some era-defining moments with a narrative mostly told from the perspective of 15 year old Jamie (Lucas Jade Zumann) and his 55 year old mother Dorothea (Annette Bening). Mills tells a semi-biographical story of a young man growing up during the second wave of female sexual liberation, and his interactions with the women around him. Bening plays Dorothea with a great deal of poise and wisdom; she is the chain-smoking matriarch with a big ramshackle house and an even bigger heart. Dorothea rents out a couple of rooms in her house to help her pay the bills, but finds herself getting attached to all those who cross her path. Among the motley crew living under Dorothea’s roof is handsome burnout hippy William (Billy Crudup) who falls for Dorothea, along with Abbie a kooky-to-the-point-of-annoyance art student, played by “queen of mumble-core” Greta Gerwig. Gerwig brings some much needed panache to the role of a cervical cancer survivor who finds solace in taking care of Jamie. She encourages him to read feminist literature and introduces him to the local alternative rock scene. Added to the mix is Jamie’s infatuation with his childhood friend Julie (Elle Fanning) who is only too happy to sleep in his bed every night whilst insisting on keeping their relationship purely platonic. Fanning is very convincing as a modern self-assured young woman who is still trying to figure out who she is. Mills uses his memories of growing up in California in the 60s and 70s to tell a deeply personal account of what it’s like to live with an absent father. His depiction of era-defining moments shows a great deal of directorial expertise. However his abundant use of quirky psychedelic colour enhancements and, at times, facile symbolisms can leave you wondering exactly what he is aiming to achieve. Mills offers us a beautiful piece of 70s Americana, whilst challenging traditional filmmaking. Although impressive in their originality, these quirky techniques are a little jarring and can in the long run distract from the narrative. 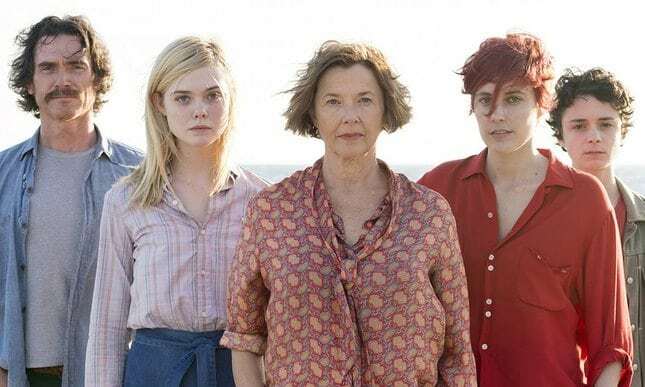 That said, what is truly remarkable about 20th Century Women isn’t just Mills’s brilliant directing style, but the highly believable performances from a beautifully eclectic cast. Gerwig as the chief trouble-maker with a big heart and Zumann’s brilliant depiction of youthful wonder are awe inspiring. But by far the biggest praise must go to Bening’s excellent turn as Dorothea. She is truly mesmerising in every single scene. On the whole, the film could have done with less artifice and more story, but it remains one of the most exciting films of the year. 20th Century Women is in cinemas from Friday February 10th.